A love of military history led me to begin collecting weapons and armour. The nobility and chivalry of the warriors of the past have always inspired me. After I bought my first few swords (cheap and of poor quality), I began to buy books and search the Internet for more information on my growing fascination with medieval weapons. 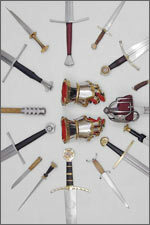 Quality weapons soon replaced my pot-metal-hilted swords, and a passion for collecting swords was born. As time passed, historical accuracy and function became more important than simply owning swords: they had to look like, and function like, their historical counterparts. I began to prefer, and still do prefer, weapons that are replicas of extant swords. I have had as many as nine swords with assorted daggers, warhammers, and helms thrown in, though my collection has become more refined and less general than in past years. I plan to continue to upgrade my collection by gradually replacing my current pieces with upper-level production and custom pieces.